Essentially acting as the Series 2 product for the main Topps WWE set, 2017 Topps WWE Then Now Forever expands the flagship line with even more wrestlers. Hobby boxes promise at least one autograph within the two guaranteed hits per box. 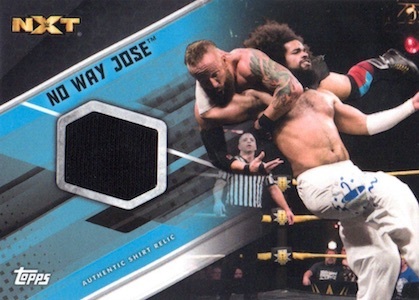 Featuring more rookie and "1st NXT" options, the 2017 Topps WWE Then Now Forever checklist taps into NXT, Raw and Smackdown Live to bring collectors an assortment of WWE stars. There are also parallels to locate, including Bronze (1:2 packs), Blue (#/99), Silver (#/25 - Hobby), Gold (#/10), and Red (1/1). Limited Image Variations return as a base chase. 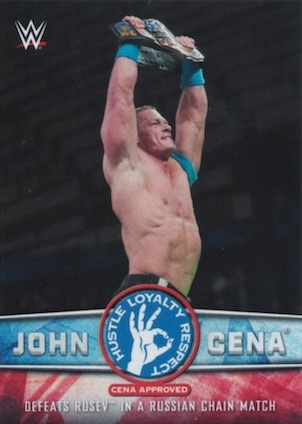 Continuing the multi-product insert, the final 10 cards in the John Cena Tribute close out the 40-card set with the fourth installment. In addition, Finishers and Signature Moves inserts drop at a rate of two per pack. Highlighting the past, present and future, the 2017 Topps WWE Then Now Forever base Autograph cards take the primary design plus limited parallels like Blue (#/50), Silver (#/25 - Hobby), Gold (#/10), and Red (1/1). A WWE staple, the Kiss cards are back with the top women of WWE offering actual lip stain kisses. The base and Autograph versions also have Gold (#/10) and Red (1/1) parallels. 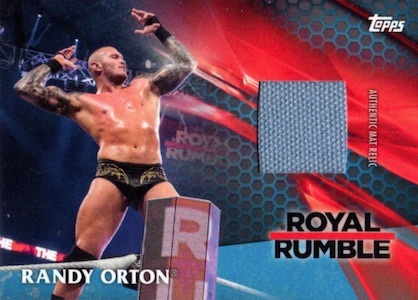 Other memorabilia inserts found in the set include Royal Rumble 2017 Mat Relics and NXT TakeOver: San Antonio 2017 Mat Relics, along with Shirt Relics and Dual Relics, which pair wrestler-worn shirt swatches with event-used mat relics. Lastly, we have the manufactured Championship Medallion Relics for the title-holders. The relic inserts also offer Bronze (#/99), Blue (#/25), Silver (#/25 ), Gold (#/10), Red (1/1) and Autograph versions. Card numbering continues from 2017 Topps WWE. PARALLEL CARDS: Bronze (1:2 packs), Blue #/99, Silver #/25 (Hobby), Gold #/10, Red 1/1, Printing Plates 1/1. Work in progress. Shop on eBay. Email us directly if you spot any others. Base code ends in #5750; variation ends #5763. 35 cards. Shop Autographs on eBay. PARALLEL CARDS: Blue #/50, Silver #/25 (Hobby), Gold #/10, Red 1/1. 5 cards. Serial numbered #/10 or less. 19 cards. Serial numbered #/299. PARALLEL CARDS: Bronze #/99, Blue #/50, Silver #/25, Gold #/10, Red 1/1. 19 cards. Serial numbered #/99. PARALLEL CARDS: Blue #/50, Silver #/25, Gold #/10, Red 1/1. 14 cards. Serial numbered #/10. 10 cards. Serial numbered #/50. PARALLEL CARDS: Silver #/25, Gold #/10, Red 1/1. 8 cards. Serial numbered #/99. PARALLEL CARDS: Gold #/10, Red 1/1. 10 cards. Serial numbered #/350. 20 cards. Serial numbered #/299. 16 cards. Serial numbered #/10. Final cards in continuation set. 50 cards. 2 per pack. Good: Stephanie McMahon and Triple H autographs; at least one signed card per box; fairly inexpensive break. Bad: Very little to product beyond the hits; mostly sticker autographs; weak insert lineup. The Bottom Line: While it does expand WWE's flagship product, it is fair to wonder the need for a Series 2 when it packs so little else. The main draw here is the (small) shot at on-card McMahon or Triple H autographs. 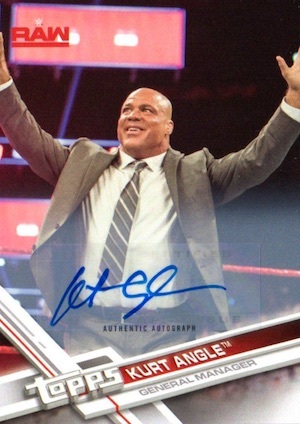 As the follow-up release, 2017 Topps WWE Then Now Forever continues the base numbering, design (again with mostly dark backgrounds) and parallels from the initial WWE set. Variations are also back. In terms of design, there is little that is actually new. 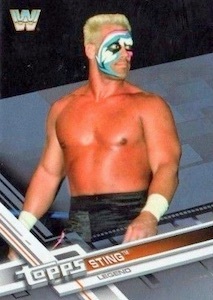 Inserts include several batches of tribute cards and the Finishers and Signature Moves set, which uses a smoke/haze effect to border the image. As a flagship-type set, I would have liked to have seen a few more inserts and a bit more creativity. Many of these releases can feel somewhat stale given the very basic format, and that is more true for round two. Even the hit designs are nearly the same, except it's NXT TakeOver: San Antonio instead of Brooklyn, and Royal Rumble instead of SummerSlam. 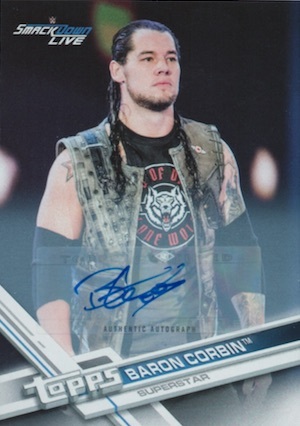 Just as with the main 2017 Topps WWE set, TNF is at its strongest in the autograph checklist. The Stephanie McMahon and Triple H autographs are the clear standouts, and made even more appealing as both are hard-signed. Also quite rare, the triple autograph featuring Undertaker, Lesnar and Goldberg is all quality. The rest of the signers are mostly in the current and up-and-coming category, so the end result can be less appealing. Priced in the $40-60 range at the time of this review, the lower box price and guaranteed autograph helps the value. While you are more likely to hit a weaker signer, the chance at McMahon and Triple H, plus several of the other stars, gives the potential value a nice bump, as well. Still, if you don't pull a bigger autograph, it can be difficult to even come close to the value paid. Other than that, you need a Kiss card or low-numbered parallel for any chance at a decent return. While the dark backgrounds again controlled the feel of the set for me, the amusing images offer something that can be enjoyable to dive into. The problem for me as a collector is that there is little else. Tons of base, one main insert and the Cena Tribute continuation is all there is other than the two hits. I need more to draw me in. Of all the licenses that Topps holds, WWE seems to be the one with the most potential for creativity as far as inserts and designs. Hopefully they can better tap into that for 2018 and beyond. 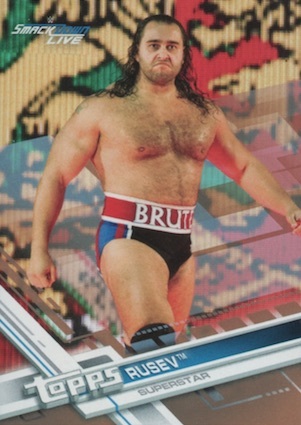 Simple word is why, do we need yet another wrestling set from topps. They already make to many as it is. Topps has killed the market with an abundance of relics and autos. No more for me, i jumped off this derailed train long ago. I like the concept of the set, and I like that it extends the flagship set from earlier in the year. This time something bothers me a bit about it, and it’s not something I remember noticing before. None of the superstars featured on the cover of the box/packs is available as part of the base set. In fact, in the case of Alexa Bliss, she’s only available as a rare hit, or a WalMart exclusive insert. This seems like a pretty misleading design.